The state of your gut is extremely important to your overall health, and it is the source of suffering for so many. The Human Microbiome Project found that we have over 2,000 different strains of bacteria that live on and within us, with the majority of them being housed in the digestive tract. Microbes help us digest food, and they communicate with our immune cells. 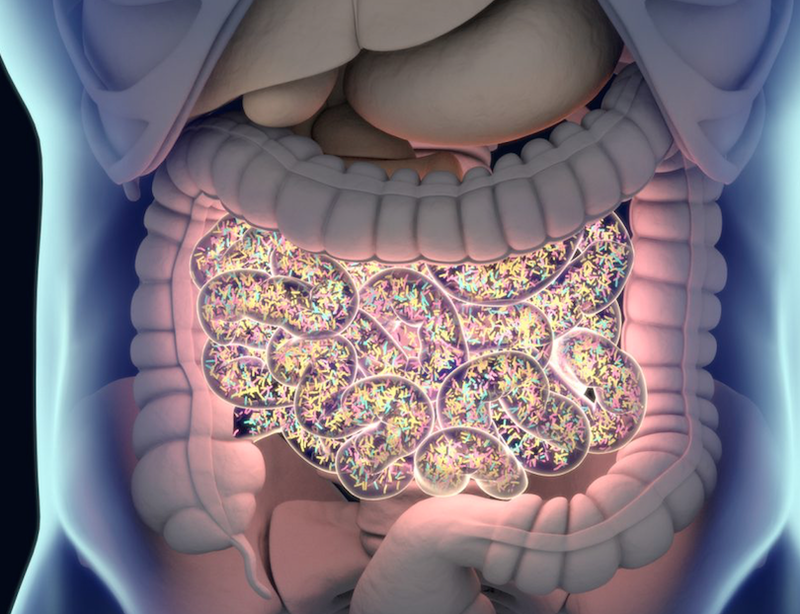 The gut microbiome is important to the immune system and many other systems within the body. When your microbiome becomes imbalanced, dis-ease can occur. Some things which can cause damage to the gut microbiome include the chronic stress response, antibiotics, alcohol, NSAIDs, parasites, processed food, chemicals, environmental toxins, and pesticides. A recent study on mice found that the creatures had changes in their microbial composition within just ONE day on a western diet. Their metabolic expression was changed which means the information the cells exchange was altered. In order to heal your body and mind it is important to heal any digestive distress going on. The United States now produces over 74 billion pounds of chemicals a day. Being exposed to all of these chemicals on a regular basis is said to cause gut imbalance and make our bodies 400% more sensitive to foods. Experts are saying this is in part why so many people are coming down with autoimmune conditions and food sensitivities including gluten and dairy intolerance. If you heal your gut, you can heal your life. Did you know that over 70% of your immune system resides in your gut? Your gut is the first line of defense your body has against toxins. Think of your gut as the immune-system command center, it determines what threats there are present to your body. With that said, individuals with an unhealthy gut tend to get sick more often than those with a clean and proper working gut. This doesn't just include coming down with the common cold or flu—many chronic illnesses can originate from gut problems, including: irritable bowel syndrome, inflammatory bowel disease, chronic fatigue syndrome, diabetes, migraines, arthritis, depression and anxiety, allergies, asthma, autoimmune disorders, and even some cancers. Leaky gut syndrome or intestinal hyper permeability is a condition that happens due to intestinal tight junction malfunction. The tight junctions in your gut keep things out such as toxins, microbes, and large undigested food particles. This means that when your gut is damaged and you eat, some of the undigested food proteins can slip out of your intestines and into the bloodstream causing an inflammatory response, or in severe cases an autoimmune reaction from your body. Leaky gut can be attributed to many factors including: modern diet, chronic stress, chemicals and pesticides, infections or viruses, and over-the-counter and prescription medications (especially antibiotics). The leaky gut reaction can sometimes lead to new food sensitivities because your body is unable to identify the undigested proteins and particles and your immune system marks that once familiar food as an "immune threat", thus triggering an inflammatory response every time you consume it, until the gut damage is healed and microbiome is restored to normal function. This means that you can potentially have a sensitivity to a food now that you were fine eating a year ago. mood issues such as anxiety, depression, and agitation. Science is proving the huge link between the gut and optimal mental health. 90% of your serotonin is made and stored in the gut, not the brain as one would think. This means that if your gut is imbalanced it can effect the production of serotonin which is a crucial neurotransmitter for many functions throughout the body including: mood regulation, sexual function, appetite, sleep, memory and learning, and temperature regulation. Serotonin can also affect the functioning of our cardiovascular system, muscles, and various elements in the endocrine system. If your serotonin levels or production is off you might suffer from mental health issues such as anxiety or depression. In fact, the most popular anti-depressants and anxiety medications on the market are SSRI's (selective serotonin reuptake inhibitors) which increase the amount of serotonin in the brain by preventing unused neurotransmitters from moving back into the pre-synaptic neuron. People with anxiety disorders typically exhibit lower levels of serotonin than normal. By healing your gut, you can work on balancing your serotonin levels naturally, which can in turn, increase your energy, help you lose weight, and stabilize your mood. In the words of Hippocrates, "All disease begins in the gut." Gut health is the future of wellness, as science is proving that without a healthy gut microbiome we cannot attain optimal physical or mental health. Weight loss is also hard to achieve if your digestive system is not working properly. Over 70 percent of your immune system's antibodies are produced in the gut, and modern society has its way of wreaking havoc on our digestive systems. With the effects of chemicals, pesticides, GMOs, antibiotics, medications, infections, and stress--most people's gut microbiomes are a mess! If you are ready to take the appropriate steps to heal your gut and take control of your health, let's talk! The Wheatgrass Warrior approach offers food sensitivity testing, support and guidance, nutrition education and healthy recipes, self-care, and personal development techniques to help you jump-start your new health journey! I can help you figure out how to cleanse your body and mind, and unlock the key to a healthy gut, and happy life!